Italian Photo Competition 2018 Winners! We have had an amazing response to our first Italian photo competition, GRAZIE to all of you who entered. I hope you have enjoyed seeing all the different photos as much as I have. A massive thank you to Helen Samson who has judged the competition, I really appreciate her help with this and her professional eye. The standard of the photos were so high that Helen has not just chosen a 1st prize but also a second and a third. Helen has kindly given a critique on each of the photos which I hope you enjoy reading. 1st prize goes to …… Ben Turner for his beautiful photo of Martina Franca in Puglia – AUGURI!! Critique: A great image with the wet street leading the viewer towards the piazza. The composition is very good with the typically southern Italian buildings framing the view into the middle distance. Nicely exposed throughout the image. The presence of people enhances the scene. 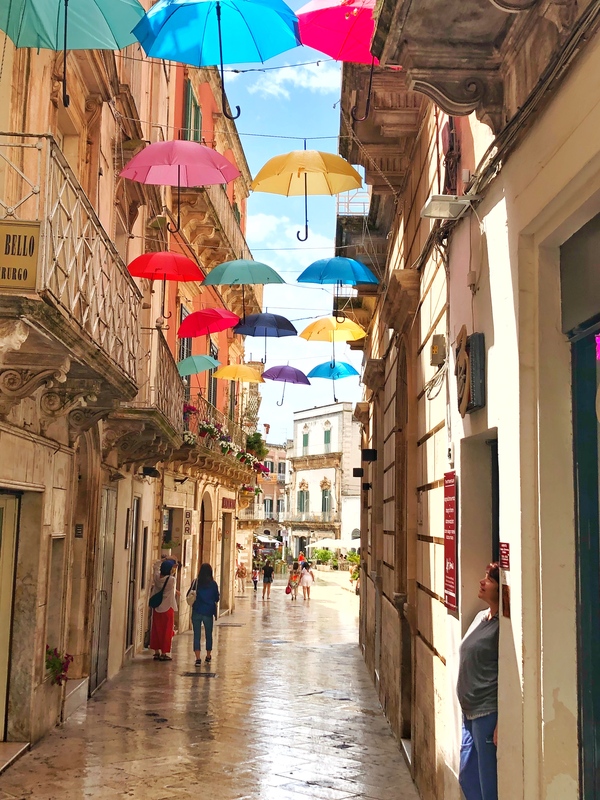 The reflections on the pavement add interest but the highlight which really makes this image stand out are the brightly coloured umbrellas at first floor level. How lovely!! 2nd prize goes to … Paul Brennan for his wonderful photo of Il Palio in Siena – AUGURI!! Critique: An excellent image which really captures the movement, excitement and crowds in the Piazza del Campo during the Palio. The monochrome rendition works very well. 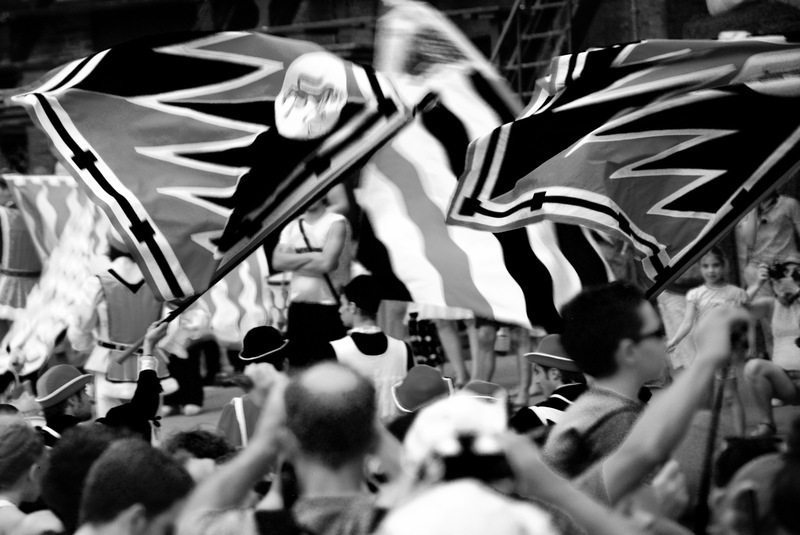 The depth of field focuses the eye on the waving flags with the foreground and background being slightly blurred – very clever. Well done. And 3rd prize goes to … Janet Abbott for her photo of one of the most beautiful bridges in the world! Il Ponte Vecchio, Firenze! – AUGURI!! 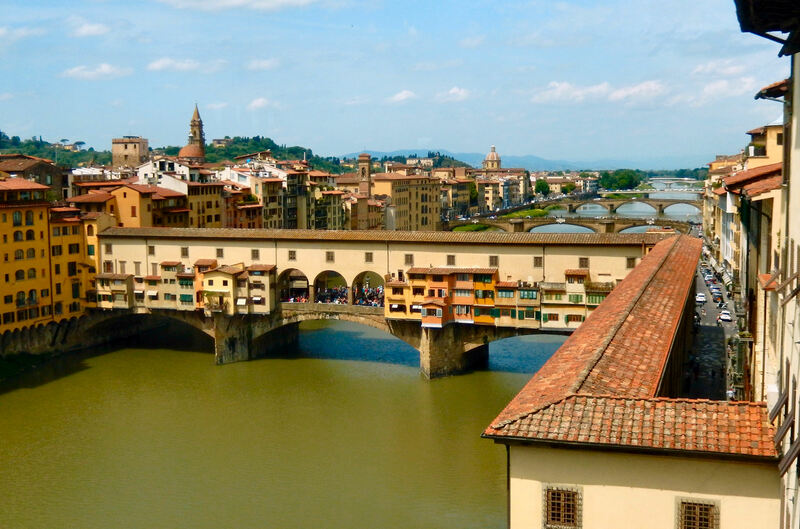 Critique: A great photograph with excellent framing – the zig-zag roof leads the eye towards the Ponte Vecchio itself and the river and riverside buildings on the opposite side lead diagonally into the distance with hints of the Apeninnes in the far distance. The image is sharp throughout and the exposure is spot-on with colour and detail in the sky. One of the best images in the entry. Well done. Click on the link below to read the critique of all the entries. Grazie again for making this such a successful competition.